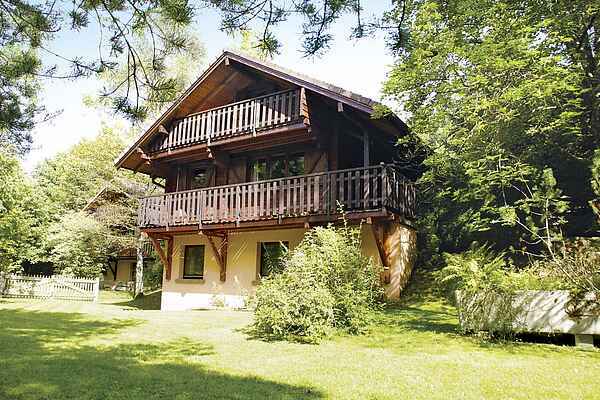 Your chalet is situated in a quiet neighborhood, surrounded by a beautiful, enclosed lawn with large shady trees. The garden is on a lower level in the back as the chalet is built on a slope. There is a small babbling river, 'la Moselotte', that flows alongside the yard. Your chalet is located in the Parc Naturel Régional des Ballons des Vosges. 'Ballons' stands for rounded peaks. One of these is called the Hohneck and is located nearby (21 km). The highest is the Grand Ballon (30 km), which is 1424 m high and offers magnificent views. Along the way you will see numerous waterfalls and enjoy wonderful mountain scenery. Bike rentals, a tennis court, bakery, supermarket and restaurants can be found in La Bresse (5 km). You can find the usual mountain streams and lakes nearby, but for real water recreation we recommend the Lac de Longemer (16 km). You can go sailing, pedal boating, boating and swimming. One nice cultural excursion would be to the city of Colmar (56 km). You will also find several spas in the area, where you can relax for the entire day: Plombières-les-Bains (49 km) Luxeuil-les-Bains (67 km). In La Bresse Hohneck (3 km), there is a large bicycle park.